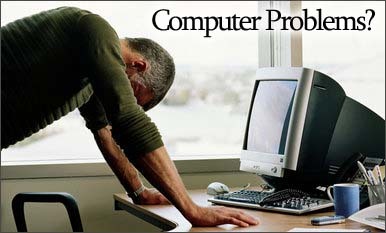 Well there's no denying it - No matter how new or how well maintained our computers are, we all encounter computer problems sooner or later. The good news is that we don't have to face them alone. There are tons of resources available to walk us through computer issues but it may take a little knowledge in knowing how to access them. This article will show you how. It's funny, but people seem to forget that every computer and every program installed on a computer comes with its own help file. Even the operating system of a computer has a help file and it really should be the first place to look for answers. Help files are designed not only to guide the usage of a computer, they're also designed to solve problems. Inside a help file, look for a section called, "Troubleshooting" (or something similar) when you need to resolve an issue. This section is reserved for solving problems specific to the software or hardware that you're using. If you're having a problem with a piece of software or with a hardware part, try the website of that software's or hardware's manufacturer. Most (if not all) manufacturer's reserve a portion of cyberspace and dedicate it to support the products that they build. Microsoft's help desk is good example. Fan sites probably isn't a good name for this resource, but you can find websites that are dedicated toward supporting the users of a particular software program or piece of hardware. We've called them "fan sites" because the maintainers of these sites have no affiliation with the manufacturers that they support! Call them what you will, but their free help is immeasurable and without it, we wouldn't have some of the wonderful workarounds and unique problem solving techniques that we have today. Another underused resource on the Internet, Usenet newsgroups have hundreds of discussion groups dedicated to some of the most popular computer systems, operating systems, hardware manufacturers, and individual software programs. Sometimes, the representatives of these companies participate, but most of the time, the support in this group is user to user, which is just as valid because you're working with a team of experienced people. Another source for help that we shouldn't forget are the support systems of various manufacturers. You can reach these systems by calling the phone number associated with the product that you're having trouble with. Calls may be free (1-800 or 1-877 number), or they may cost a small fee (1-900). PC support groups or user groups are another option for help. These are groups that meet in libraries, computer stores, or other local areas and they discuss all sorts of issues related with a particular product. Even if you aren't experiencing a computer or software problem, user groups are fun to participate in and they can help you network into other interests such as job or teaching opportunities. Surprisingly, you may even get a helping hand from the salespersons at your local computer store. We don't recommend that you make this your first pit stop when you experience a problem, but we don't recommend that you rule this option out altogether either. Computer salespersons are hired for a reason - and that's their knowledge. Often, these kind folks can help you resolve an issue over the phone and prevent you form having to buy a costly solution. Have you ever encountered any computer problem? How did you solve it? Share your comments and/or contribution below. Nice article to get help when an individual faces trouble with the PC! It's true that we sometimes forget help files. But what if someone forgets admin login password :)!? In that case, how can the person get help with? May be you can add another point called "web surfing". People can search on Google and read helpful tutorials to solve their PC issues. Thanks for your contribution. BTW, "web surfing" is too generic. Points number 2, 3 and 4 are all under surfing the web for answers. When you forget your admin password, you can start by trying the hint which you provided when setting the password (unless you didn't), search the internet or call/visit the nearest service centre of your computer manufacturer. For Windows users visit Microsoft Support and this post by PC World. For Mac users visit Apple Support or this post by "Kappy" on Apple Support Community. I think these should help solve the problem.